Join the NEW KARATE REVOLUTION! GM Andrew Linick/Publisher GM Keith Yates/Managing Editor/Creative Dir. for USA–Foreign orders inquire at hanshilinick@gmail.com. For bulk orders 25 to 100 copies, ask for wholesale pricing. Printed issue available in one week. Questions? Email me. Osu! 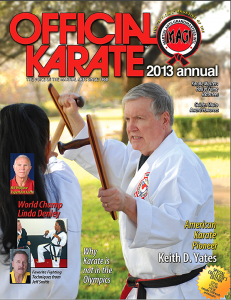 GM’s Art Camacho, Don Wilson, Cynthia Rothrock enjoying the 2014 OKM Annual with Master Mark Kline on the cover. Photo Copyright (c) 2014 by GM Keith D. Yates. All Worldwide Rights Reserved ! and Download $50.00 worth of FREE… Bonuses! An EXCLUSIVE interview with the stunt coordinator and the stunt men for the blockbuster Teenage Mutant Ninja Turtles movie. FInd out what kickboxing champ Bob “Thunder” Thurman is up to these days and read about “Budo and the Badge” author Pat Ciser and his adventures as a Jersey cop. All this and much more in the Summer 2014 Issue. Click on the cover image here to read your FREE digital copy. ATTN. ADVERTISERS: Reserve your ad space in upcoming issues and find out how you can get a free ad in the next printed, collector’s edition Annual. Reach hundreds of thousands of martial artists, teachers, students, masters, GMs, school owners, clubs, vendors, MA/MMA organizations, tournament/seminar/webinar/camp/Hall of fame/event promoters, fans, friends and readers in over 126 countries. CONTACT US TODAY at 631.924.3888! Ad Deadline: April 1st for the Spring issue. 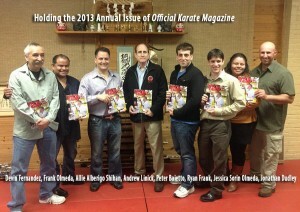 Pictured are masters and grand masters holding their COLLECTOR’S EDITION copy of the 2013 Official Karate™ Annual Issue. Remember the printed annual is a limited-run issue and can be ordered from us at the discounted price of $7 (plus shipping and handling) until supplies run out. THIS 2013 (with Keith D. Yates) and 2014 (with Mark Klien) PRINTED ANNUALS ARE STILL AVAILABLE! Contact us to order your copies. Now reduced to just $7 plus shipping. “My father’s fascination with the martial arts began with a single reverse punch delivered by his future sensei, John Kuhl (who appeared on our first cover at left) — a punch that not only sent him sprawling, but ignited an insatiable curiosity. He became a sponge for knowledge on the subject and it wasn’t long before he realized that the public deserved, indeed needed, to know more about these ancient disciplines. He also recognized the need for a forum through which instructors and practitioners could share their knowledge and skills. OFFICIAL KARATE TM was born. Now, over 40 years later, a talented and devoted team of Grandmaster practitioners led by Andrew Linick and Keith D. Yates have chosen to resurrect this, the first martial arts magazine published on the east coast. Young practitioners of all styles will be kept abreast of events in the martial arts community as well as learn of their shared heritage—of those who made the martial arts the popular phenomenon that they remain today. The masters, the ones that have withstood the test of decades of devotion, will be able to look back fondly on the glory days of American martial arts. Everyone wins. Copyright©2016 OfficialKarateMag.com • All Worldwide Rights Reserved!